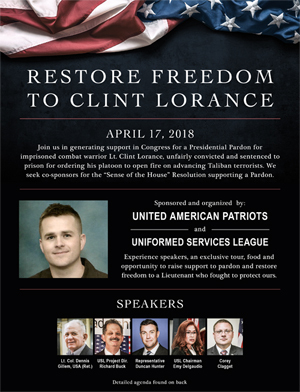 With barely a week until the May 20 Freedom Leadership Conference in Northern Virginia, this month’s conference sponsor, Uniformed Services League, issued a bulletin praising advocates for neglected American military veterans, including Congressman Mike Coffman, Fox TV Journalist Pete Hegseth and its own spokesman who will keynote the conference, Dr. Johnnie Simpson. The early bird discounted tickets for dinner with Dr. Simpson expires at 11 PM tonight although there is still time to reserve the free tickets to the conference which begins at 7:30 PM at the Hilton Gardens Hotel on Rt. 50 near I-66 in Fairfax, Virginia. To order either the free 7:30-9 PM conference tickets (doors open 7 PM) or the 6 PM dinner with Dr. Simpson and Conference Leadership (doors open 5:30 PM) click HERE. To read the bulletin issued by Uniformed Services League praising advocates for American veterans and giving more examples of neglect of veterans and the Veterans Administration attempt to muzzle whistleblowers trying to help America military veterans click HERE. Examples of heroic whisteblowers include the story of Ann Good and Landis Brandfield who work at VA, and Washington Times reporter Jacqueline Klimas, Rep. Mike Coffman, Rep. Jeff Miller, Rep. Krysten Sinema, Rep. Brian Babin, the American legion, AMVETS, Iraq and Afghanistan Veterans of America. To see the event flyer either click on the image on the front page or click HERE. If you missed last week’s announcement about the May 20 conference scroll down or click HERE. We hope you will not miss this May 20 conference to support the work of Dr. Johnnie L. Simpson helping American military veterans getting bad treatment from the government which promised to help them in return for their service. Dr. Simpson and USL will have a petition to conference attendees to sign to support the “VA Accountability Act” of Congressman Jeff Miller.